With Kanban 101 we are aiming to give our readers a jump-start guide to get their Kanban engine running. For this purpose we are going to use Kanbanize, so you can start implementing what you learn right away. The board is the first gradient of Kanban. Without it there are going to be just random sticky notes posted everywhere and they won’t be any different from the mess that most of us have on our desks. We can think of the board like the river where our work items flow. Depending on how we shape the river we can either be productive and have a positive outcome, or just let our to-dos pass everywhere around us losing control over the situation. The typical Kanban board has three columns: To Do, Doing and Done and in Kanbanize the columns are as follows: Requested, In Progress and Done. In time you will find certain patterns in the way you work and in the phases, your work items pass through. Each of these phases can be separated from the “in progress” state and defined as a Kanban column on its own. More about this is to follow in the posts to come for the more experienced fellows. The board in Kanbanize similar to the physical one consists of three main areas: Backlog, Workflow, and Archive. The Kanban workflow has three default columns – To Do, In Progress, Done. Depending on the complexity of a work process, these three stages can be divided into many smaller sub-columns. Regardless the complexity of the workflow and the number of sub-columns, the main stages remains the same: Requested, In Progress and Done. Logically after the Backlog comes the Requested area. You pull the work items that have been added to the Backlog and place them in the Requested area. This is what you plan to work on next. The to-dos are organized in the order they will be tackled. Those ones which you plan to process first appear higher in the column compared to the ones you plan to handle later. This is how you prioritize tasks with Kanban. Every item that has been pulled from the “Requested” stage and hasn’t been completed yet is “in progress”. Even if you have started to work on a given item and then you stopped, it is “in progress”. And it remains so until it is completed or removed from your flow in which case the time that you have invested in this item converts into “pure waste” according to the Kanban method. This is the state where all completed items are pushed to. Note that in Kanban there isn’t such a thing as “almost done”. If it is not completely done then it is still “in progress”. Temporary archive – you can keep all of your completed items for a given period of time (let’s say a month). Permanent archive – after the time-box from above expires, it’s recommended (from functional and performance point of view) to move the completed items here. Don’t worry, the items are not deleted, just “zipped”. You can restore them at any time. The outlined example is just one of the many implementations of the archive. Depending on the complexity of a work process there could be many different Kanban Board templates. Check out our dedicated article for more Kanban board ideas. 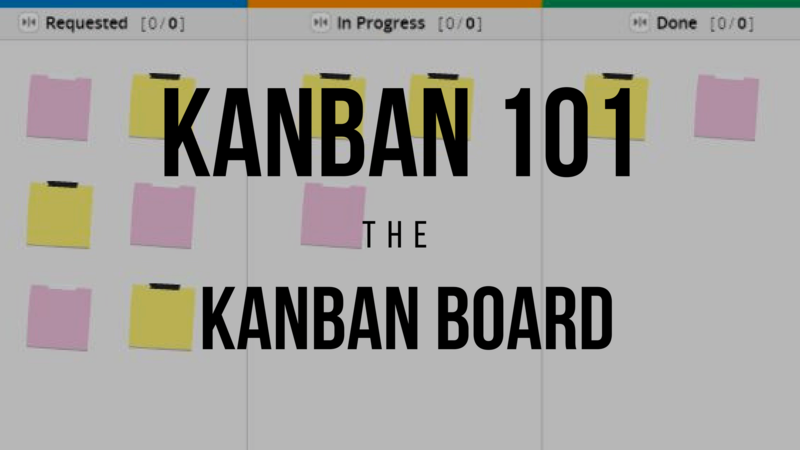 Stay tuned for more of the Kanban 101 blog series. Happy kanbanizing!